As high school students at the time, Iqbal and Geti also participated in DSF processions. Many political meetings, including DSF, were held at their house in Guru Mandir. As my mamoo, the journalist Zawwar Hasan used to say, she was ‘Jagat Apa’ to many of Akhtar and Sarwar’s friends. ‘Salahuddin, the judge’s son, was among the lawyers arrested from the SHC on Monday. He was also among the few lawyers to be released early Tuesday morning. He was unharmed, but Haider Waheed, another young lawyer released around then, had bruises on his neck and upper back caused by blows from police fists when he tried to resist arrest. 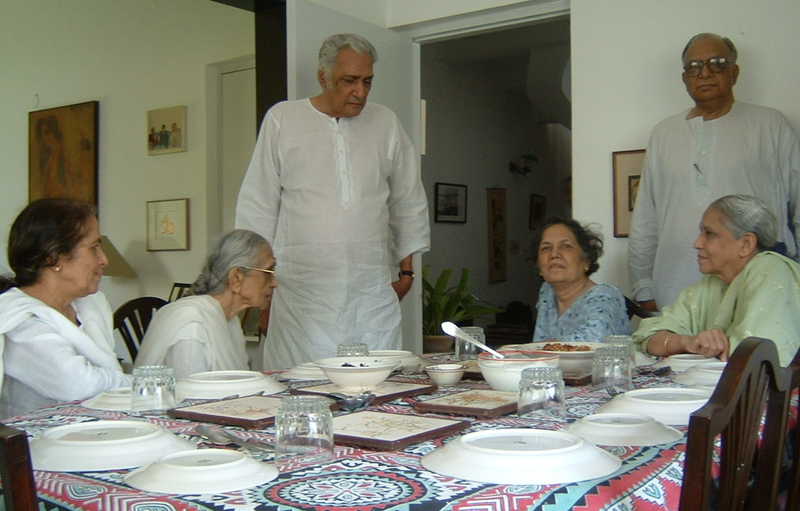 Tahira and Haleem’s first child, a daughter named Sadiqa, was born in Mandiri (near Allahabad) in 1920. Not having a son must have been something of a disappointment – sons continue the family lineage and run the family properties while daughters are considered ‘guests’ in their parents’ homes, to be brought up and trained so that they don’t disgrace their families after getting married and moving to their husband’s home (at which point they also needed to be provided with dowries). The son-cult was alive and well in the Mandiri household, but daughters were also cherished. Tahira’s own mother Mariam was a resolute, propertied woman in her own right, who managed her own lands, dealing with tenants, munshis and the like. …The couple had ten children over the next twenty years. Three babies born after Sadiqa were all boys, but the first two died in infancy. Across from Company Bagh lived the nationalist politician Motilal Nehru whose son Jawaharlal was a friend of Tahira’s brother Abdul Latif. Jawaharlal’s only child Indira was slightly older than Sadiqa and the two played together. Sometimes, holding hands, they would go round to the courtyard by Sadiqa’s kitchen where Fazlu, the family cook and a great storyteller, would recount tales from ‘Alif Laila’ (Arabian Nights). Jawaharlal’s sister Vijay Lakshmi Pundit, active in the Indian National Congress-led movement for independence from British rule, would also visit, trying to convince Tahira’s mother Mariam to let the girls of the family participate in political work. After all, this was a family of strong women who contradicted the stereotype of Muslim women being weak and submissive. The family had a history of being politically involved and knew of a relative who had been among those who were hanged in the sweeping retaliations spearheaded by British soldiers after the 1857 rebellion. The Nehrus also counted on Abdul Latif as a staunch nationalist and member of the Indian National Congress. He was active in local politics, one of the few Muslims on Allahabad’s municipal board where he was on the district education board and held office as president of the municipality. All that, and much more, was changing as women, mostly from the elite classes, gradually joined nationalist politics and entered the public sphere, using the small footholds they gained to push ahead. The first direct mention of women in politics came when the Muslim League session held at Calcutta in 1912 acknowledged “a powerful development of opinion all over India in favour of emancipation of our women”. This mention, as Shahnaz Rouse (2004) notes, is made in a brief paragraph after over 200 pages documenting League sessions. It “does not constitute an independent recognition of the need for women’s education paralleling that of men” and was made in the context of emphasising women’s contribution to the Muslim community as a whole. By 1920, at the League’s extraordinary session, also in Calcutta, “a number of women appeared on the speaker’s platform alongside men”. The League later adopted “Ladies and Gentlemen” as the preferred mode of address, and its resolution of the early 1930s favoured “suffrage, representation and equality for women”. Some women, forced to emerge into public life, did so while remaining veiled — like the wife of poet and nationalist Hasrat Mohani, jailed for his anti-British ideas. Obliged to travel between her house in Aligarh and his prison in Faizabad, she moved court — not for his release but for his transfer to a jail closer to home (the petition was refused). … Despite his interrupted formal education, Akhtar was an outstanding student burning with the desire to share his good fortune with others. Driven by a natural curiosity and love of learning, he would devour the books, journals and newspapers brought into the house by Latif. He absorbed the constant political activity that Latif was engaged in and was to be one of the forward-thinkers of the family, after his brother-in-law Dr Waheed. They both disagreed with traditions they considered outdated, like landlordism and not allowing girls to attend school or engage in political activity, but cherished family traditions like hospitality, good manners and respect for elders. .. Like many young people of the time, Mumtaz, Nasim and Tahira were also swayed by the ideas of socio-economic and class equality unleashed by Russian Revolution of 1917 in far away Soviet Union. The participation of Indian soldiers of the British army in two world wars widened horizons. The wars forced caste Hindu sepoys to break the centuries old taboo against crossing the ‘black water’, and the more well-to-do also broke the taboo to go overseas as students. In England, young Indian students of various faiths developed ideas about colonialism, freedom and public participation in politics. Progressive Indian Muslims even in the conservative UP began moving away from the concept of purdah, realising the disadvantages and injustices involved in keeping women secluded uneducated. Within Tahira and Haleem’s family, changes began to be ushered in after Sadiqa married the forward-looking Dr Waheeduddin in March 1933. Waheed had graduated from Allahabad Government College in 1925 and studied medicine for six years in Lucknow, the seat of Muslim culture. However, he disliked the burqa and prevailed upon his wife to give up the purdah. In deference to his wishes, Sadiqa also took to the sari rather than the more traditional ‘tang pajama’ or ‘gharara’ associated with Muslim courtly culture that other women in the family wore. She initially found the changes difficult to adjust to but grew to like the greater freedom. After that, she wore only cotton saris. Her mother Tahira, on the other hand, only ever wore tang pajamas. Other than this difference in their daily attire, for the present Sadiqa’s life remained much like Tahira’s, just fifteen years older and more like a sister to her. Both had been married on reaching puberty to older men, marriages arranged by their families. They were barely in their mid-teens when they first gave birth (although Sadiqa had fewer children). The children born to them once Sadiqa became a mother were roughly the same age, but their daughters’ lives would be drastically different from theirs. 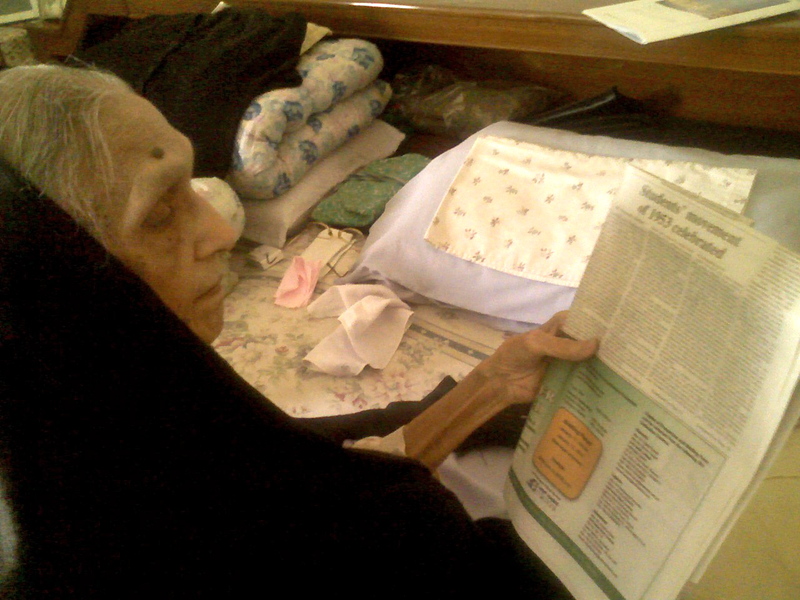 I am sorry to learn about Mrs. Sadiqa Waheeduddin’s passing away – more than a year later. Dr. Waheeduddin was our family physician and a dear friend of my late father, Mr. S. M. Owais. We used to call him “Doctor Chacha”. I have been a patient of Dr. Iqbal Waheed and Dr. Irshad Waheed as well. I hope they are all doing well. Someone forwarded me the You Tube link of the DSF history documantary you have made. Very well done. I heard the names I had known from childhood. I had also heard of the movement but did not really appreciate the full extent of it. Thank you. Thank you, nice to hear from you and get your feedback. I read about sadiqa waheeduddin i want to know about saeeda gazdar.plz share about her. Thanks for your concern. She has not been well for some years. if you have some details about her or any writing about her plz share with me. I am working on her short stories and poetry.